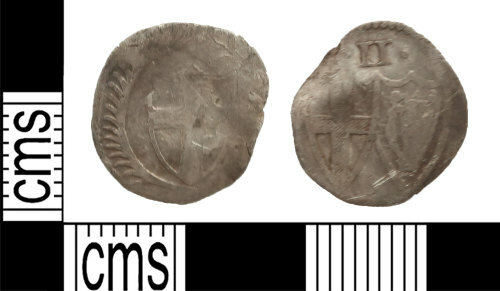 Silver post-medieval commonwealth halfgroat, dating to 1649 - 1660 AD. Obverse of shield of St George within wreath. Reverse of shield of St George conjoined with shield depicting irish harp, beneath the numerals II. The coin is 15.57mm in diameter, 0.64mm in thickness and weighs 0.81g.